From where you get them?? since "MikeD": http://scforum.info/index.php?action=profile;u=2789 doesn't send to us any announcements about v.5.0. Ok pal, I was already sent mail to Mike... who know maybe they will give to us some beta release for testing. It should be a very exciting release! Thanks for reply Mike. Good Luck with v5. This link is Ok... Don't know why you have problems?? We are getting close to a public pre-release test build - we are hoping to have one in the next few weeks - but as always we only release items when they are ready as that is more important that "rushing". SUPERAntiSpyware will remove all the spyware, not just the easy ones. Quick, complete and custom scanning of hard drives, removable drives, memory, registry, individual folders and more. Includes trusting items, and excluding folders for complete customization of scanning. Detect and remove spyware, adware, malware, Trojans, dialers, worms, key loggers, hijackers, parasites, root kits and many other types of threats. Light on system resources and won't slow down your computer like many other anti-spyware products. Repair broken internet connections, desktops, registry editing and more with our unique repair system. Real-time blocking of threats. Prevent potentially harmful software from installing or re-installing. - Light. Powerful. Effective. FAST. - an all new scanning engine provides fast scanning while being able to detect even the most stubborn threats! - All New Interface provides easy access to all important tools and features while presenting itself in an easy-to-use layout! - Enhanced Real-Time Protection helps detect threats before they enter your system - so light on system resources you won't know it's running! - Smaller/Faster Definition Updates reduce the load on your system while updates are being downloaded and applied! - Power Scheduling of definition updates, quick, complete and custom scans - uses the Windows Task Scheduler for maximum flexibility! security solution or to complement an existing solution, providing an excellent layered approach to protection. 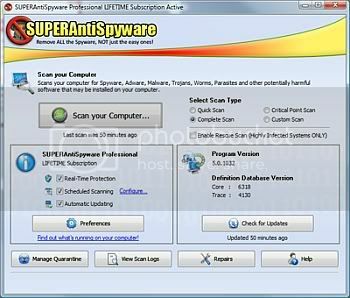 Pre-release version of SuperAntiSpyware 5 Free edition is available for download from their website. Since this is pre-release software they are making limited number of copies available each day for download for testing to the public.